About a year ago I was jogging went off a 6 inch curb like any other time. When I hit the ground a sharp pain went up from about my right mid shin all the way into my knee and then stayed there. The first two or three steps were almost impossible to keep from falling over. With a ton of concentration and work I managed to limp over to the family vehicle without anyone really noticing. For the next two days all I did was sit and stand some but my knee still hurt. 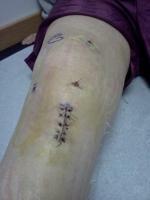 3 weeks after that I started into my soccer season and still the knee kept hurting mostly on the inside. A few weeks in my knee was kicked on the outside. Eventually on the day of my last game I went to the doctor. The doctor didn't impress me at all. Each time I sounded like I might be worried the doctor would tell me nothing was really wrong and that I didn't have anything to be concerned about. For the check up he bent my knee a few times pushed on the knee cap and then had me watch a video on overuse of the knee and Patella-femoral syndrom. That night I was kicked on the inside of the same knee again. My knee swelled within about 2 minutes of being hit, I was limping but still able to run. Some months later I went back to the doctor having followed his instructions of rest and ice with still the same problems. I had absolutely no problems with my knee up until the day that I told you about above and again I confirmed that to the doctor. To make it all the more frustrating he told me the same thing and took note that my knees both turn in a little but my left doesn't bother me at all. Then he said that he wouldn't have X-rays or MRI done because he knew they wouldn't find anything and told me to go to PT. A few months later I went to physical therapy and worked really hard with him for nearly 2 months and over all there wasn't any improvement. Finally I had an X-ray and MRI and neither one showed anything. So is this it I just have a knee pain that started cause of a curb or is there something more that the doctor missed? Though I can still run but my knee bothers me almost daily is there something more wrong? Should I be looking for a different doctor?